Before the more famous (and, frankly, spectacular) cherry blossom season comes the plum blossom season. In fact, originally, hanami (flower-viewing) referred to ume (plum) not sakura (cherry). 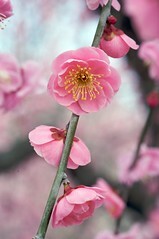 Now, while sakura season is great and all, there are a great many things to recommend the appreciation of plum blossoms. For one, the plum blossom season comes much earlier (and, for those sick of winter, symbolizes the beginning of spring in Japan). The peak of the blossoms also lasts a lot longer (a few weeks rather than a few days -- and sometimes only one or two days in the case of sakura should there be strong winds or heavy rain). Finally, plum blossoms have a much wider variety of blossoms in colors ranging from bright red to purple, pink, and white (there's some variation among sakura as well, but it's harder to find; most of the trees you see in parks are clones, or so I hear). Finally, plum blossoms smell nice -- sakura doesn't smell like much at all. There are some ways in which ume can be a bit underwhelming, though: sakura does tend to be more spectacular, with more flowers in big bunches covering the tree in vast quantities of flowers, making for solid white canopies -- plum blossoms are sparser, which just a few flowers spread along the length of the branches (which also don't all open at the same time), so the trees themselves (even in large groves) aren't particularly photogenic. However, there's something to be said for the restraint as well (a shot of the sky or nice scenery through the branches can be nice), and the individual flowers can be every bit as photogenic (if not moreso) close up. So, here's the first set from Soga Bairin in Odawara. Incidentally, you might get the impression from these pictures that the vast majority of plum blossoms are pink -- that isn't actually the case, white flowers are actually far more common. However, for whatever reason, all the best pictures I took that day were of the pink trees (which, color aside -- I'm not a fan of pink in general, but fairly neutral towards the flower color in this case -- I think those were the prettiest flowers in terms of form). There's a lot more variety in the pictures I plan to post tomorrow. I saw your photos and was overwhelmed by the memory of the wonderful *scent* of them. I don't think I could ever choose between ume and sakura. I love the restrained beauty of ume; I love the fragrance, and I love the Zen-ink-painting way they look on the branches. They're like a beauty designed for an ascetic. Well, no, that's not fair. They're more sensual than that. But they're kind of an under-control sensuality. Whereas sakura seem totally out of control! But also, because they have no (or not much...) fragrance, they have a kind of ethereal non-presense; they're more fairylike and less tangible. Anyway, I like both a whole lot. Yeah, I mostly agree with you. Those photos are beautiful! There was a temple right near my church in Hirakata. I remember spending a great deal of time there when their little park of ume trees was in bloom. It was still cold but they were so lovely! Thanks for the memory.